Solapur is a city located in the south-eastern region of the Indian state of Maharashtra. Solapur is located on major road and rail routes between Mumbai and Hyderabad, with a branch line to the cities of Bijapur and Gadag in the neighbouring state of Karnataka. It is classified as a 2 Tier and B-2 class city by House Rent Allowance (HRA) classification by the Government of India. It is 49th-most-populous city in India and 43rd-largest urban agglomeration. Solapur has the top sugar factory' s in India.The number is 36 in 2016 and can go to 40 in next year .The production of to sugar is 8% to total production in India and 17% in state. The copower production of sugar mill will reach 750 mv in next 3 years which is 500 mv now.The industry is given 40000 employers in this district. Also NTPC is setting 1320 mv power plant of in south solapur of investment 10000 cr. Due to growing demand of cement in state four cement factory are start production of cement in south Solapur namely ultratech cement of investments of 1000 cr, chettinad cement to investment 1500 cr, birla cement to investment 1000cr and zuari cement of investment 500 cr. Solapur is located at an important junction of the North-south railway line which provides good transportation infrastructure for trade and industry. There are a number of medium and small scale and medium industries found in the district, and it is one of the prime centres of the handloom and powerloom industry, cotton mills and the beedi industry. Rapier Terry Towels is now also an emerging industry in Solapur. Solapur is well known for the bed sheets produced here, and has a reputation for the same. Textiles are an important aspect of the economy. As the epic growing part in industrial sector, "Sanghvi Towels" are known as the parents of Rapier industries. They introduced the city how to go with the flow of changing demands of the Terry Towels market, following it many business houses have changed to Rapier Industries and now Rapier Chaddar Looms have been also introduced to the weaving sector by Bomdyal Textiles. The city is home to Precision Camshafts Limited one of the largest manufacturers in camshafts in the world. In the agricultural field, the district has a well established market in oilseeds. The major crops grown in the district include jowar, wheat and sugarcane. Also,nowadays Solapur is developing with a rapid pace having foreign outlets like Dominos, McDonald's and mall like Oasis Mall and theatres like E-Square. Beedi industry is the second important industry in Solapur district. Beedi is basically a kind of local cigarette, where tobacco is wrapped in a tendu leaf and tied at the end with a coloured thread. The work of beedi rolling falls under the category of cottage industry. Typically women are employed in these industries and they work from home. The largest beedi-producing industry in the state of Maharashtra is in the district of Solapur. There are 115 units of 29 various beedi factories. Solapur railway station is the main railway hub within the city. The Solapur Railway Division is an important division connecting South India to Western & North west India. Trains from Ahmedabad, Jaipur, New Delhi, Mumbai, Pune etc., ply to Southern states (Telangana, Karnataka, Tamil Nadu & Kerala) via Solapur. Solapur internal city transport is managed by SMT (Solapur Municipal Transport), SMC and other private cabs. 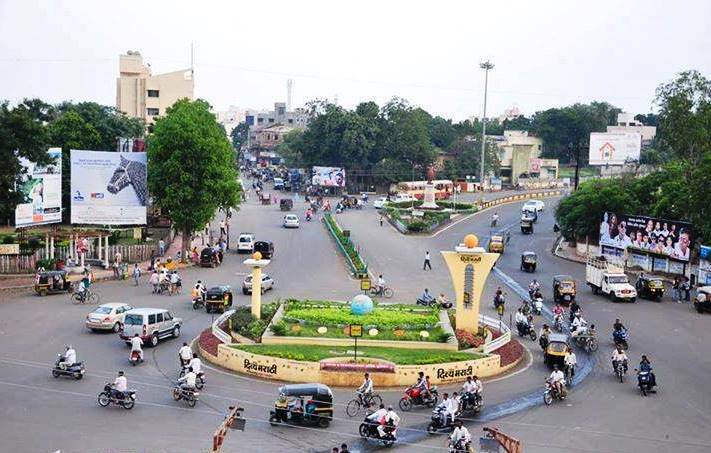 Solapur is well connected by road with major cities of Maharashtra as well as the adjoining State Capital of Hyderabad and important cities in Karnataka by four National Highways – NH 9 highway connecting Pune with Vijaywada via Hyderabad, NH-13 connecting Solapur to Mangalore, Karnataka and NH-211 connecting Solapur to Dhule. Ratnagiri-Nagpur National highway NH-204 passes through city, connecting Solapur to other important cities in Maharashtra like Nagpur, Sangli, Kolhapur and Nanded. Recently sanctioned National Highways- (Solapur - Kalaburagi) and Ratnagiri-Solapur-Yavatmal-Nanded-Nagpur. (Solapur-Bijapur) Road section in NH-13 is proposed to be improved by its four laning. The Solapur-Aurangabad national highway is also proposed for its four laning to reduce the time and cost in travelling from Solapur to Aurangabad. Solapur Airport (IATA code: SSE) is located to the south of Solapur city. There are no scheduled flights operating out of Solapur Airport. The Government of Maharashtra has planned to upgrade the airport. No Comment to " SOLAPUR - Industrial Development Post Independence "